LOVE ME DO – The lyrics of The Beatles song in the shape of a heart on a print you can download. We love THE BEATLES, and the lyrics of their classic song: LOVE ME DO, fits perfectly into a heart shape all typed out. It’s a simple print that looks great in a regular frame printed on nice thick paper or you could just print it on regular printer paper and use a vintage typewriter to showcase it like we did here. A few years ago, I found this vintage typewriter while thrifting, and it’s still one of my favorite finds. Isn’t it the cutest?! 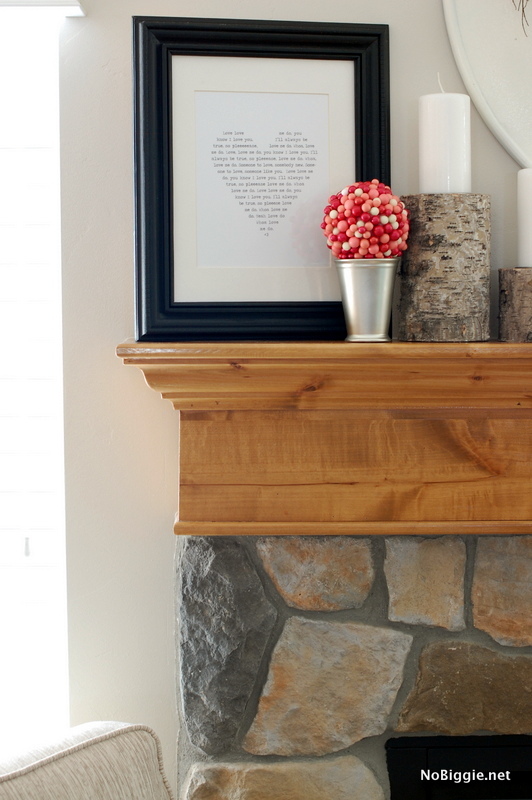 We made this print for the typewriter…cute Valentine’s Day decor. No red and pink, just straight black and white. 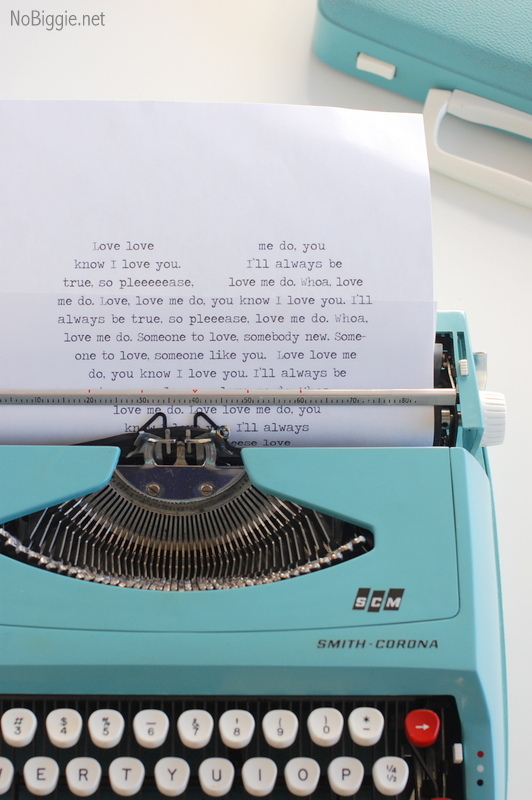 If you had a pink typewriter (swoon) this print would be perfect for it! It looks like I typed it out myself with this simple typewriter font. Imagine how long that would take you right now to type this out manually with no mistakes. It’s like a different world we live in now. Our kids will never know. Click to download: Love Me Do printable. *All printables are for personal use only and for NoBiggie subscribers and followers. 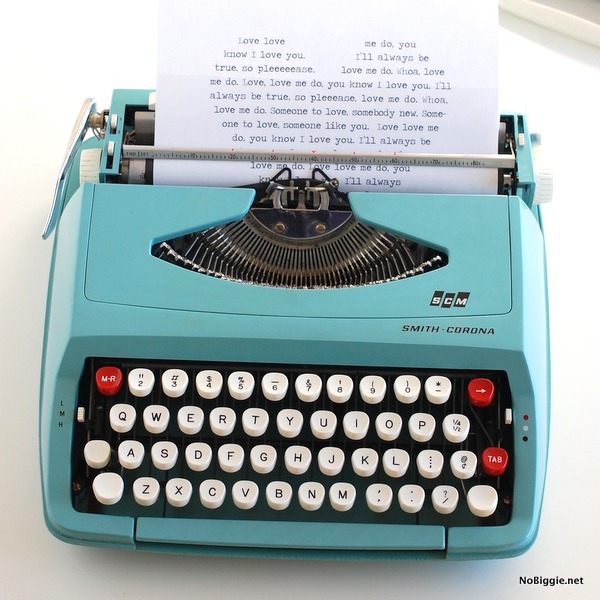 Ok…I’m taking a risk here…showing my age (LOL), but I had this exact typewriter as a teen. Wishing I still had it. Thanks so much for the printable, I love it! You bet! Thanks for saying thanks! I love that you had one just like it, that’s awesome! Oh my goodness, this is WONDERFUL!!! Thank you sooo much for sharing this print with us! I am going to try my first track back to share this with my readers .. thank you again 🙂 I love your site!! Found this through Pinterest when I was looking for something for Valentine’s Day for my husband and this is perfect! We both love music and have a special connection through the Beatles and I think he’ll really like this framed up in our room. Thank you so much for sharing! I’m so excited! I taught typing (on manual and Selectric typewriters) and had pictures that could be created by typing and spacing. This would have been in that folder too! Thanks for bringing me back in time!